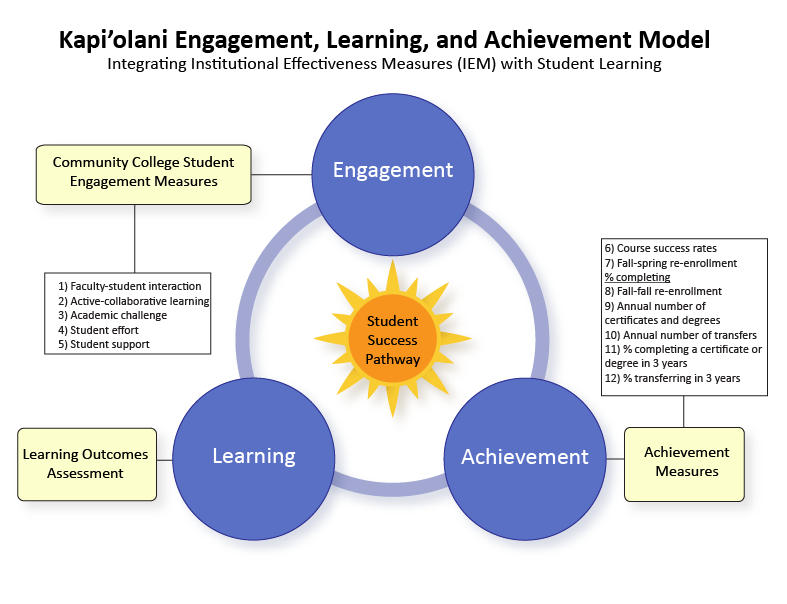 Institutional Effectiveness Measures (IEM) are ten core effectiveness measures to support the operations of institutional goals and objectives as defined in the Kapi‘olani Community College Strategic Plan. These further support the five performance measures set forth by the University of Hawai‘i Community Colleges (UHCC), aligning the College’s planning efforts with those of the UHCC system. Here are detailed tables tracking the data of these four measures. Demographics include all students, as well as categorized data for Filipino, Native Hawaiian, Pacific Islander, and Pell recipient populations. How a student spends one’s time? What students feel they have gained from their classes? How students assess their relationships and interactions with faculty, counselors, and peers? What kinds of work students are challenged to do? How the college supports an individual student’s learning? To learn more about assessment or Taskstream at Kapi‘olani Community College, contact the Institutional Assessment Coordinator Don Westover at donald.westover@hawaii.edu or visit our assessment website.